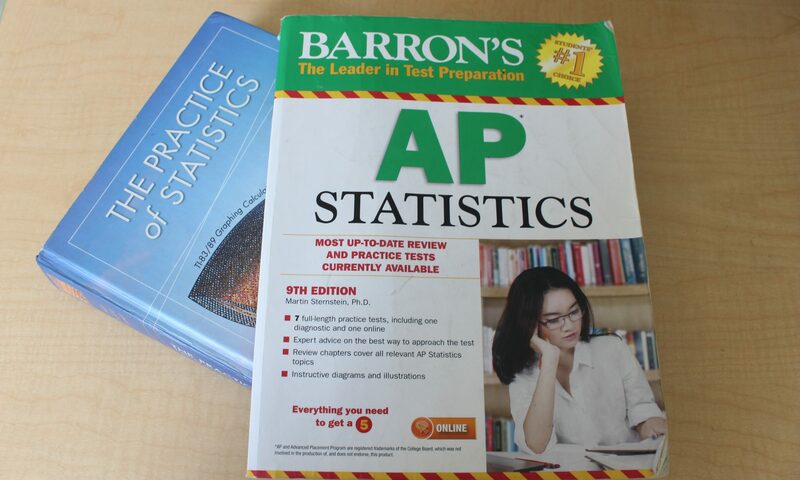 Correlation in a statistic is a factor used to describe the relationship between one variable and the other variable. In a graph, there are two axes: X-axis (explanatory variable) and Y-axis (responses variable). For example, If we would use height to predict weight then the height would be the explanatory variable and the weight would be the response variable. 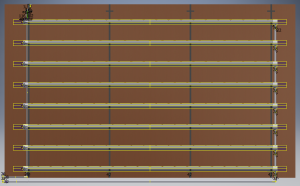 Then we would use the data of the height and the weight to calculate for the correlation coefficient (r). The correlation coefficient(r), rage from -1 to 1. When the r-value equal to -1, it shows that the two variables have a negative relationship/correlation; in this case, it means that as the height increase, the predicted weight will decrease. On the other hand, if the r-value would to equal to 1, the two variables will have a positive relationship/correlation which means that as the height increase the weight will also increase. Yet, if the r-value equal to 0, the two variables don’t have any relationship at all. However, a perfect r-value of -1, 0, or 1 is not a value that we’ll get calculating real datasets because real datasets won’t have such an exact relationship between real datasets. The equation for r is r =1/n-1∑(xi-x/xs)(yi-y/ys), however, it would take forever to plug in and solve this equation; so we use the Ti3 calculator instead. In our case of using height to predict weight, we receive an r-value of .76. This value shows a high correlation between the two variables, therefore, it’s positive to use the height to predict the weight. Watch me solving for the r and r-square value! This round in chemistry essential, I have learned so many new concepts that manoeuvre me deeper into the world of chemistry. For instance, we were learning about the Lewis Dot Structure and Vsepr Model. These two concepts were very interesting to me because it gives me a better sense of how chemical bond together at the atom level. Lewis dot structure is a diagram that shows how atoms are bonding together and how many lone pairs of electrons are there in the molecule. For example, if we have an element of Phosphorus trifluoride (PF3), we would start off by looking for the valence electrons. 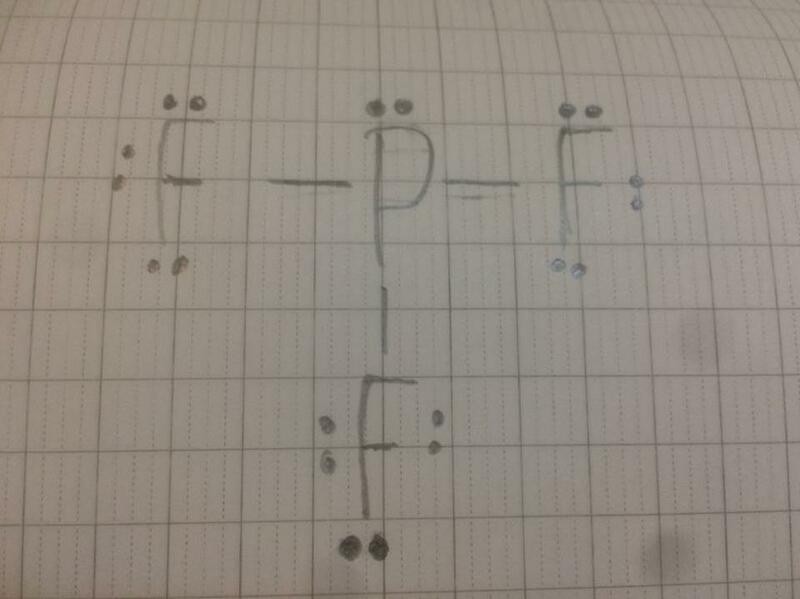 In this case, the valence electrons for Phosphorus and the three Fluorine is 5 and 21 respectively. 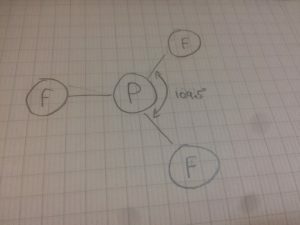 Then, we would draw P (symbol for Phosphorus) in the middle of the diagram since it’s less electronegative with five dots (representing the valence electrons) around it. However, the dots can’t just be laying everywhere around the P: It needs to be placed on the four sides of the P (top, right, bottom, and left.) 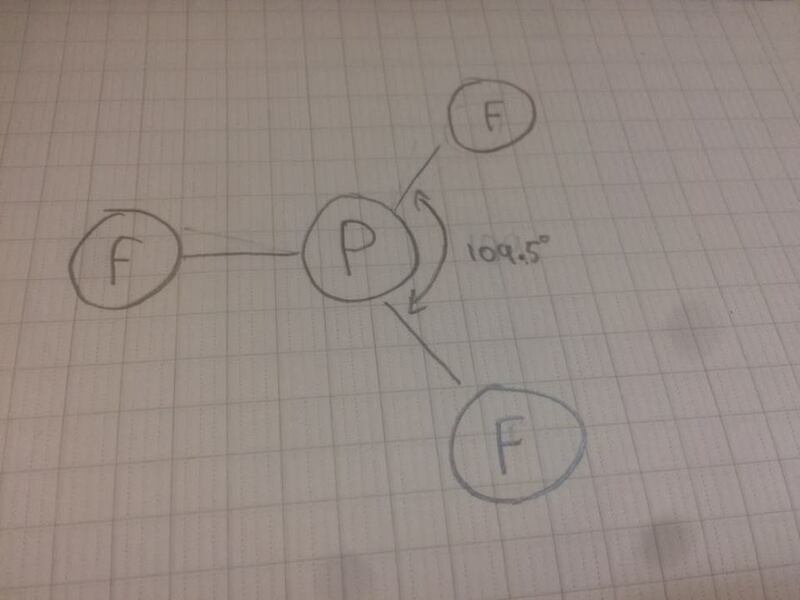 Then we need to define the bonding between P and the three Fluorine (F3). Since Phosphorus has three valence electrons, it only needs 3 more to get to the stable stage. Therefore, it can share its three individuals electrons with the other three individuals electrons from the three fluorine. 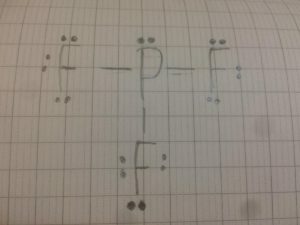 So we can draw three lines from P to the three fluorine with a free pair of electrons on the top of P and 6 free pairs of electrons around each F.
Afterwards, we can also turn this structure into a 3D model using the VSEPR model. Since this diagram got three bonds with a free pair of electrons on the centre atom, it falls under the category of Trigonal Pyramidal. Chemistry is the scientific discipline involved with compounds composed of atoms (google.) Chemistry is one of the four essential classes Liger provide this year. Two years ago, we got introduce to chemistry by a Princeton student. Back then we were just learning the very basic of this subject which include atoms and significant figure etc. For this first round, we were basic review stuff that we learn two years ago with the new facilitator. Yet, we did experiments/labs along with the topic we went over. My most favorite lab so far is the flame lab. 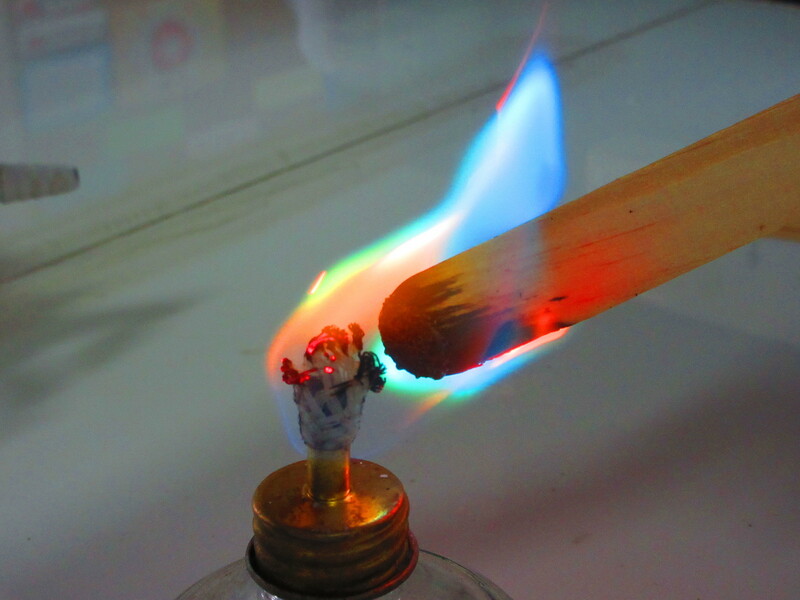 In this lab, we were basically testing different salt on fire to see the change in color of the flame. So first we deep a popsicle sticks in fresh water, then deep it into the salt, and then put on the fire. By heating the salt up is like adding energy into the atoms. Therefore, it makes the electrons shift from the inner shell to outer shell which produces photons in the process: create colors. My most favorite reaction is when the fire reacted with the Copper Chlorine. When Copper Chlorine reacted with fire. We start of the year in our literacy class by developing our English skills through learning about American history. Since many of us are going to take the SAT, Cara, our literacy facilitator wanted us to get more exposure to the American history. Therefore, we read many articles about various of topic related to the American history: Native Americans, the American Civil War, American Immigration, American Meat Packing Industry, and America in World War Two. By using online websites such as Commonlit and Newsela, we’re able to read the articles then do the assessments which are really helpful for me to assess my understanding. My most favourite article is an article about how the American industries help America to win World War Two. After reading this article, I have a much better understanding of the factors that lead The United States to the victory of World War Two. Moreover, I have realised that it takes there’s more than brave soldiers to win the war; the citizen, in fact, is a great cannon use to destroy the enemy. For instance, The United States won the war because their citizen work really hard to produce weapons to supply the solider. With a very productive supply line, America then took down Germany and Japan and claim the victory. There are so many aspects that make Liger different from the public school one of those is the curriculum. At Liger, most of the class were conducted in English, yet we still spend 5 hours a week learning our native language: Khmer. Unlike the classes in public school, our Khmer class also have small projects like research papers and poems. At the end of last year, we started to write poems about any topic we like. Then now, at the beginning of this year, we decided to turn those poems into a book along with some research about the different type of poem and their history. After the book is finished, we have a showcase at the Khmer Literature Festival in Battambang province. Surprisingly, we got a lot of support: we sold out all of our printed books. After the showcase, we found out that there are some parts of the book that needs to be further edited before another showcase in Phnom Penh Book Fare in December. Zeus or Jupiter in roman, is the god of skies, thunder, lightning, hospitality, honor, kingship, order and the ruler of the Olympus (king of the gods). Zeus has the ability to control the weather, thunder, and lightning. Moreover, he could mimic anyone voice and even shapeshift to look like any person or any animals. As the king of the gods, Zeus spends most of his time on Mount Olympus where he upholds any institution related to the state. He also protects the people and looks after the well-being of the whole human and god community. Zeus was a last son of the Titan Kronos and goddess Rhea after his older sibling: Hades, Poseidon, Hera, Hestia, and Demeter. Zeus ends up married with his older sister Hera(god of marriage mother) who birth the two gods Ares (god of war) and Hephaestus (god of blacksmith and fire). But even before Zeus marry Hera, he had a love afire with a titan name Metis who help him to defeat Kronos. This love affair actually gave birth to the god of wisdom and war Athena. But before Athena had the chance to see the sunlight, Zeus swallowed Metis with Athena inside her stomach due to the fact that he scares that the child would overthrow with just like what he did to his dad. However, Athena born out of Zeus force head and become Zeus’s most favorite child from many other children from his love affair with other gods, moral, and even animals. In fact, some of the Olympic gods are Zeus children such as Apollo, Artemis, Athena, Aphrodite, Hermes, and Dionysus. Born with a cruel and heartless dad, all Zeus’s older sisters and brothers got swollen by their dad, Kronos, due to the prophecy that says that one of his sons would rise against him and take all his power. Luckily when it came to Zeus’s turn, his Mom, Rhea, swap him with a boulder, wrap in cloth, for Kronos to consume. Zeus then got raise by the nim of the forest in a cave at the iron of Kreek. When he got older he got educated by an eagle who traveled the world and gathered all the new of what is happening in the world. When Zeus reached adulthood, He found out about his true identity and the terrible faith of his sibling. So he finds out a way to recuse his sibling and to defeat his dad by make him drink a poison which causes him to vomit all Zeus’s sibling. Now with support from his brothers, Zeus finally defeated Kronos and became the supreme leader of the whole world. The powerful Zeus got light skin, dark eyes, dark long beard and hair, and enormous body muscle. Moreover, Zeus has a really overpowered weapon which is the lightning bolt. The lightning bolt was given to Zeus by a group Cyclop who’s also got swollen by Kronos, and rescue by Zeus himself. As a king, Zeus also has a scepter as his weapon and the Aegis as his shield. Zeus also was known as the god of justice. Therefore he also had a set of scale beside him doing his judgment. This mighty god also has the eagle as his favorite animal. Therefore, today, eagles are being used to represent power for many culture and country. The country like the US for example, use the eagle as the national animal to show off their power. In the Honor of Zeus, the Ancient Greek created a festival called Olympic which was a multi-sport competition in Olympia. During the day of the event, they dispatch 100 oxen as scarification to Zeus. At the end of the day, another scarification is been made by the athlete to thanks for their success. “Over time, the game flourished and Olympia became the main site of worship of Zeus. So individuals and communities donate statue, building, and other dedication to the god.” From this dedication, a temple was built with a 42 foot Zeus statue stand inside it. The temple then called the temple of Zeus. Time passed, the game is even more popular. Today the Olympic Game become one of the biggest sports events in the world. Zeus was the god of weather. He makes rain, storm, lightning, and thunder according to his mood. With his great power, people are so cautious of making him angry, because if he gets angry, he’ll make immense storms destroy everything in its path. Everything has strengths and weakness, so does Zeus. Even though he was the strongest god of all, he still got an obvious weakness, Women. Women were Zeus’s weakness because he can’t control his feeling toward good looking women. That why he always cheated on his wife Hera. From his great power and this particular weakness, he became the father of men. In our literacy class, we were learning about ancient Egyptian. So besides their amazing structure of the pyramid, there is a belief of afterlife for the wealthy people such Noble and Pharaoh, mummy. Mummification is a step for the god of death, Osiris, to judge on the person soul whether or not they are going to the afterlife which was believed to be much likely to the life on earth and that the soul would like to use the old body. Therefore, while learning about the process of mummifying, we actually assigned to perform the steps of mummifying. Here are the steps of mummifying. Removal of the Brain: With long hooks, the brain is extracted through the nasal passage. The Egyptians didn’t think that the brain had any special use. Organ Removal (Evisceration): A cut is made on the left side of the body, and the liver, lungs, and other organs are removed, dried out, and stored in sacred vessels called canopic jars. The heart is left in the body, because it will be needed to be weighed in judgment by Osiris. Dehydration with Natron Crystals: Now the body must be dehydrated (have the liquids removed) to stop decay. A type of salt called natron is used. Natron crystals are packed around the body. The crystals absorb body fat and fluids and keep the body from decaying.9 After being treated for about 40 days, the corpse10 is washed and dried. Stuffing: Because the body has lost much of its mass, resin11-stained clothes or bits of sawdust are used to pack the corpse, which by now has also lost its eyeballs. Pieces of cloth are stuffed in the eye sockets and painted black. At this point, the corpse’s lips and cheeks are painted. Oiling the Body: This elaborate12 process includes massaging, perfuming, and anointing (blessing with oil) the corpse. Arrangement of the Body: Depending on which period of Egyptian history the deceased lived in, the arms are either placed to the side of the corpse, folded on its chest, or placed with hands on shoulders. Wrapping: The body is wrapped in several layers of fine linen; and various body parts receive particular attention. This process takes two weeks, after which a resin is added to the bandages. Funerary Mask: A mask, sometimes made entirely of gold, is fitted to the mummy’s body. Symbols of gods often adorned14 masks. Burial of Waste: All materials used to prepare the corpse (such as natron and bloody linen) are placed in a jar and buried away from the mummy’s tomb. This is a gender-related article that I wrote for my literacy class. “Boys, what is your opinion on girls keep getting these sports opportunity and you don’t,” asked Dominic Sharp the country director of the Liger Leadership Academy when he visits the gender equity exploration. No one answer. In many cultures, girls are defined as weak because they are often physically weaker than men Therefore, physical activities such as sports have been seen as masculine and only for males. For example according to the Football Association (FA), in 1921, the association bans women from playing on Football League grounds by the statement of “…the game of football is quite unsuitable for females and ought not to be encouraged.” Despite the fact that women have a long history in this sport, they are still seen as unsuitable for the game. After half of a century, the FA finally lifted the ban, yet there is still lack of support for women in this field. Even though women are no longer banned, Regardless of the unban, for many countries like Cambodia, women are expected to be soft and gentle and sports are still sometimes taboo. Therefore sports are not under the category of what they are supposed to do. 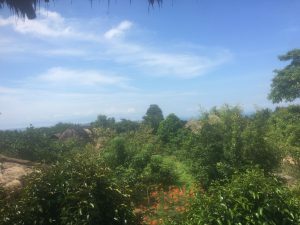 In fact, once a Cambodian girl hits puberty, they are sometimes forced to stay home and learn to do all the house chores and prepare to be a wife, which is known as “into the shade”. So there is no sport for women from family level up to nation degree. For instance, the most followed event in football, FIFA World Cup, wasn’t created for women until 1991 which is 61 years after the men tournament. This outdated cultural belief not only limits women in sports but also education. In Cambodia, girls were not allowed to attend school until after French colonization. Boys were educated in pagodas and since girls cannot interact with monks, they were forbidden. Even in contemporary Cambodia, some girls are still battling for higher education from their parent’s limitation. Once the girls reach high school, they have a high dropout chance due to many economic reasons, plus their parents perspective. So one of the most important reason is the parent’s mindset on how girls don’t need high education since they are going to be man’s wife one day. Thus, they force their daughter to quit school, help the family economically, and wait for the legal age to marry. Without education, women can’t really get into any high development field such as technology. Therefore, it has created the stereotype where this is not the field for women and women shouldn’t be in this field. So, due to these opportunities limitation, right now there are so many more opportunities and encouragement in those fields for girls. For examples, in sport, there are many spots open up for girls to train and compete in a variety of tournament. For example is that there is an opportunity open up only for girls to play in a frisbee tournament in Philippine. In education, there are many programs which giving girls full scholarship to many good universities. Moreover, there’s even world-class competition for girls in technology such as Technovation where they offer girls from all over the world the opportunity to learn the skills they need to emerge as tech entrepreneurs and leaders in a competition form. From these girl’s opportunities, boys are actually feeling upset about it, and sometimes even complain that it’s not fair. However, if we look back into our history, we can see that girls have never had any opportunity that boys have up until the last century, in fact, they still not completely have those opportunities today. So is this the fault of our ancestor? Maybe it is their fault for not fighting for the women right back in the day, but not at all. It’s actually the belief and mindsets which had developed since the birth of human raise which had waylaid them from denouncing for women right. Therefore, we should not blame our ancestor but instead, we should continue fighting for the gender equality in any field in around the world. Name that one thing that all human needed to survive, of course, food! Where are food come from? Well, agriculture is where most of our food came from. We grow a variety of food using soil and water. But as the population growing rapidly, we don’t have enough of those resources to do this old farming method. So what can we do? Well, we can instead of using soil, use a system called Hydroponic. Hydroponic is an agricultural system using sponge/perlite as growing median and water as the nutrition source. Unlike the traditional agriculture where we need a large space of land to farm, hydroponic is a system where we can install it in such a small space such as wall etc. So basically we mix the water in our reservoir with nutrition solution, and as the water flows through the system, the plant will observe the nutrition and water to grow itself. Once the water flows through the whole raising bed, it flows back straight to the reservoir and ready to reuse again in the system. By growing produce in hydroponics, we can save both land and water which are really essential for our growing population. So in an exploration called Future Food, we’re working on getting one of this new technique running so that we can supply the product to the main kitchen and for the senior cohort. In a group of eight students, I am working as a 3D designer for the project. So for any project, we need a clear plan on how things going look and how things going with each so I designed a 3D model of the whole system using a software called Inventor. 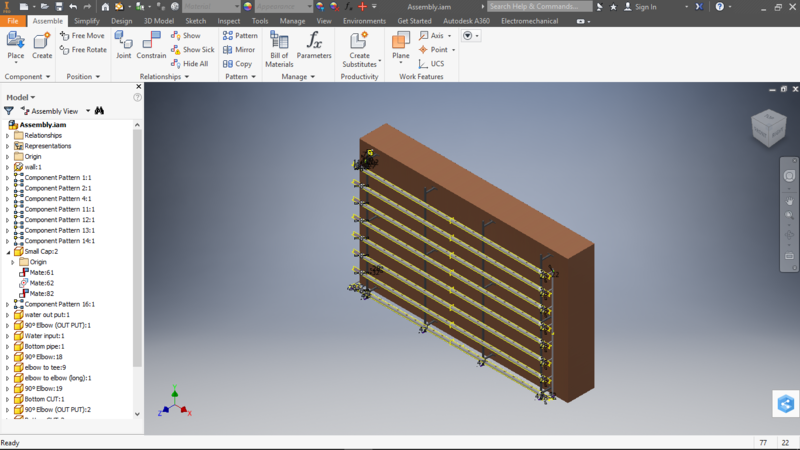 One of the biggest challenges I face during this process is finding the exact measurement for all the parts in the system. 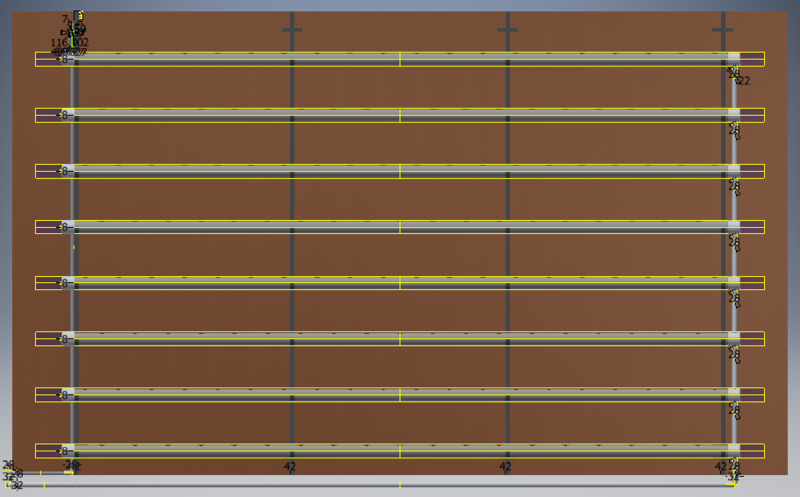 The thing is that I started working on this project without any actual parts to measure, so I have to look through all over the internet for those measurements which take so much time. This challenge gave me a good practice in my researching skill, which is a really good opportunity to improve. The views of the ocean (Taken from the Vagabond Temple). But you work hard to attract the tourist. Hi there, welcome to my blog. My name is Sophat. I was born on December 10, 2002, in Kandal province, Cambodia. Six years ago I’ve moved from a government school to the Liger Learning Center. More than just a free education, Liger had provided a really important thing that is really meaningful to me which is independence. Through the education and independent Liger had provided, I finally find some of my passion that I never know before; I am a fourteen-year-old who obsess with technology and entrepreneurship. As a change agent, I believe that those two things could easily make many positive impacts on Cambodia and the whole world which I’ll make it true one day.